Here’s everything you need to know about this movie from 1964: there is no documented evidence that the film was ever shown to anyone – anywhere – until it first appeared on Television some time in 1976. Even then, 12 years later, the film was mocked and panned relentlessly, as anyone who came into contact with the film could only speak of its shortcomings. Something that bad begins to attract a certain kind of reputation with a certain kind of movie fan, and in spite of the terrible reviews, the inexcusable acting, the cheapness of the monster(s), and the spareness and near-incoherence of the plot (even without the long musical interludes where nothing happens, the film clocks in at 75 minutes), it would not die! Rather, The Creeping Terror – miraculously! – accrued a reputation that could not be forgotten, canonized as being so bad it must be seen to be believed. 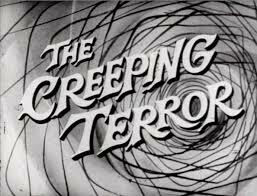 As tapes of The Creeping Terror circulated to TV stations running Shock Theater! type fare, this piece of cinematic trash not only found an audience among those dedicated to the rejects of film culture, but eventually found its way to the hallowed halls of Mystery Science Theater 3000, not only keeping it forever in the public’s mind, but forever preserving it for future generations to look at and puzzle through. Just what did they have in mind when they made this thing? You can thank the twisted mind of Vic Savage for that. “Director” does fully cover Vic’s role in this film, who also starred in, produced, edited, paid for, scammed other’s to participate in, and – essentially – made the movie what it is, in every sense of the word, at the age of 28. As the story goes, Vic paid Allan Silliphant to be the writer for the film, but it was clear once production began that Vic was in over his head, and had a “unique” vision for the film that was not what Allan was prepared for. Vic had a number of excuses time and again: the location “fell through” at the last minute, most likely something that was never secure in the first place. 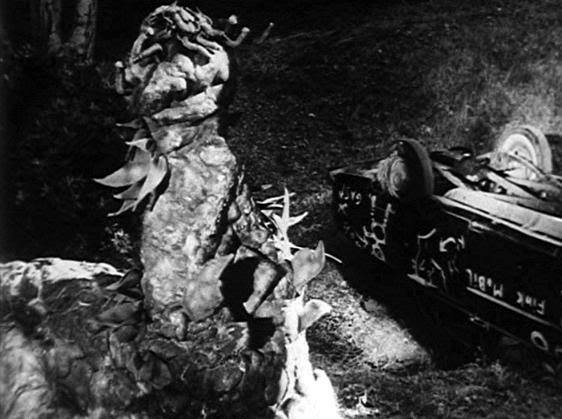 An impressive monster had been made for the production, so Vic claimed, but “disappeared” before filming could take place, so Vic and a few others created the “carpet remnants” monster you see in the picture. Supposedly the film was going to be a well-funded horror film, as Vic had sold it to everyone, but as the filming date got closer, more and more of the cast were made up of people who paid to be in the film, “funding” the production from within. Vic’s sound crew “never showed up,” so the majority of the audio was to be recorded in post-production. As the production went on, more and more people backed out, delaying time it was taking Vic to put the thing together. Vic “completed” (or, as some would say, “stopped adding to”) the film in 1964, but before he could try do anything with The Creeping Terror, everything began to fall apart. True, Vic had a working “print” to try and sell, but actors began to demand compensation for the money they had put into the picture. Allan Siilliphant, angry over the changes Vic made to the story, sued Vic successfully, over clear breach of contract. Vic actually disappeared completely rather than face the financial consequences of the lawsuit, and Allan was awarded the rights to do with the film as he wished. Allan washed his hands of it, giving it to his agent, and through a series of hand-offs that have yet to be tracked down, was eventually shelved by a TV exec who pawned the problem off on the future. Vic spent the rest of his live in a drunken stupor, and died of liver failure in 1975. He never attempted to return to film in the time since the disaster that was The Creeping Terror, and he died knowing that he was the only person who had seen it, and thus, know the vision he had for the film. In this rare instance, time was a friend to Vic Savage. Even when you fail at something so spectacularly, that failure can open up a whole world of possibility in the future. Sure, the camp value of it is the only thing recommending The Creeping Terror to modern audiences, and even on MST3K, the film is hard to get through. But I think that people see an artist trying to make their voice heard when they see a failure like this. They see themselves, barely an adult at age 28, wanting to express themselves in film the way so many others have before. Vic was willing to go out on a limb, and pay the price of that taken chance, to see his vision completed. Sure, it was a dumb vision, but who hasn’t put all their eggs in a basket, if only to learn that lesson up close and personal? To accompany the film, I’ve selected a sort of stream-of-consciousness set of tunes to complement this narrative mess. The Creeping Terror barely makes any sense, so really, just absorb the ambience and the musical accompaniment, and try to imagine yourself watching late night TV in the mid-70’s, and then, suddenly, this comes on.